In this week’s special edition of the newsletter, we wanted to share with you some of the exciting changes to the Developer Portal that we are about to roll out. The launch of a new developer blog, updated site design, and enhanced site resources mark a major step forward for our community. We’re also getting ready to welcome thousands of new developers to the community. Check out the full details below. 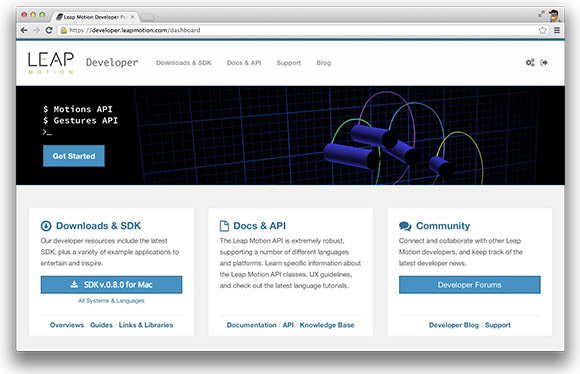 Over the coming week, we’re making big changes to the Developer Portal. Here’s a sneak peek of what you can expect. Developer Blog. Starting next week, we’re launching a new blog where members of the Leap Motion team and guest authors will be sharing their projects and insights into the future of 3D interaction, and keeping us updated on what’s going on in Leap Motion developer communities around the world. Links & Libraries. On the newly revamped Links & Libraries, we’ll be maintaining a cultivated list of the most important language wrappers, framework plugins, and examples, and we’ve made it much easier to find exactly what you’re looking for in the language you’re developing in. Knowledge Base. We’ve redesigned the Knowledge Base with an improved interface to make it easier to navigate, and structured it to allow a comprehensive body of knowledge. Developer Feedback. What do you want to see next in the Developer Portal? You’ll be able to let us know through our ideas feedback forum. We can’t overstate how important our community is to us, so we want to make sure we’re building the tools and support you need. Starting next week, the Developer Portal will be opened to the public. While new community members will still need to sign up and login to access the site, this means that thousands of developers without hardware will soon be able to access the SDK and forums. Since they won’t have access to the Leap Motion Controller until it ships next month, they will not be part of the beta program. Since we launched our developer program, we’ve seen the growth of a strong and vibrant community with stimulating discussions and inspiring collaborations. We’re encouraging everyone to champion this friendly, open atmosphere as our community expands – welcoming new developers and helping them with your insights and knowledge. Of course, you don’t have to wait until the new Developer Portal launch to let us know what you think. We’ve set up a discussion thread – add your voice to the conversation.